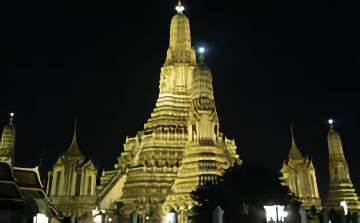 Secrets of Siam is a two day boat & bicycle tour. During the bicycle excursion participants see an abundance of nature and we bring you to places seldom visited by tourists. We pass by local markets, public parks, small villages and beautiful temples that will give you memories of Thailand that you will treasure for a lifetime. The first day of the trip includes a spectacular long tail boat ride. What & Where: This 2-day bicycle excursion starts from our office at 08:00 AM. Shortly after leaving, we cross the river and start cycling on 1 meter wide concrete pathways through plantations and small communities. While cycling through a local fresh market, participants see all kinds of strange goods. We answer all your questions and pictures are taken. A little further on, we stop at a temple made from the local tea-wares. The routing continues through a beautiful park and along small pathways, with a sea of green to both the left and the right. Here we also see the first orchid farm. Who would have thought you’d see this in Bangkok? Meanwhile we arrive at our lunch destination – a nice restaurant alongside one of Bangkok’s canals. After lunch, the long-tail boats are ready and waiting to bring us to an area known for its many shrimp- and fish-farms. We continue cycling with the feeling that you are hundreds of miles from town. We stay the night in a good 3-star hotel. The hotel has a swimming pool, so don’t forget to bring your swimwear. We enjoy a delicious Thai dinner nearby our hotel. 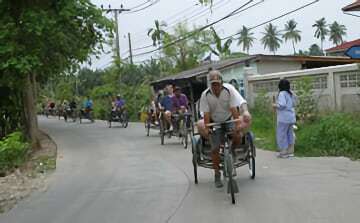 On the second day we leave at 08:30 AM, and cycle southwards to the Gulf of Thailand. We pass nostalgic villages and communities, and of course a vast array of scenic beauty. After visiting “the Ancient City”, we have lunch in a authentic Thai restaurant with a view over the Gulf of Thailand. After lunch we transfer you back to our office where Secrets of Siam ends around 14:30-15:00 hrs. During the trip we stop every hour for a short rest and drink. If you like cycling and enjoy nature, Secrets of Siam will add unforgettable memories and smiles to your stay in Bangkok.